How many times have you looked at your canine companion and wondered what they’re thinking? Thanks to body language we can take one step closer to reading our pawesome pooches. Here’s a quick guide to understanding canine communication. A relaxed dog sets their tail wagging gently and presents a relaxed body and mouth. Your pooch’s peepers will appear soft and smiling. Poised and ready an alert hound will stiffen their tail and body, ears will be slightly forward, eyes will be large and intense and mouth closed. A defensive canine demonstrates appeasement to the threat they’ve encountered by freezing their body, turning their head, but still keeping their eyes on the threat revealing the white part of the eye, known as ‘whale eye’. They’ll tuck their tail and if standing may raise a paw. 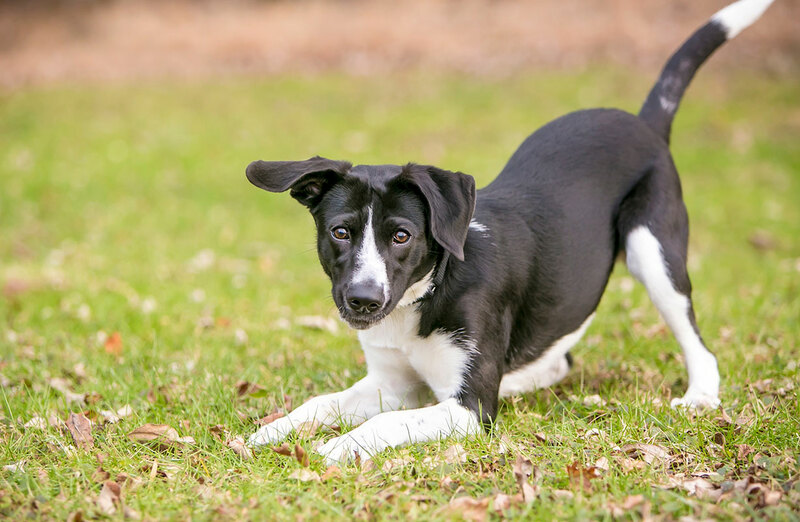 A playful pup wags its tail in arousement, drops elbows to the floor and keeps hips raised. Their delicate ears are perched forward and mouth is relaxed. Displacement behaviour occurs when your pooch is prevented from carrying out an action that’s part of their usual routine, or they’re highly motivated to do so. We humans demonstrate similar behaviour when we’re unsure how to proceed with an action, we might bite our nails or chew a pen because it brings comfort, this is the same for our pets. Displacement behaviour is a way for animals to release frustration and comfort themselves – excessive scratching, nose licking, sneezing, spinning, or shaking are just a few signals. An educational service from Merial Animal Health Ltd, makers of FRONTLINE. Further information available from Merial Animal Health Ltd, RG12 8YS, UK. ©2018 Merial Animal Health Ltd. All rights reserved. Merial is now part of the Boehringer Ingelheim Group of Companies. Date of preparation: Sep 2018. PE2655.